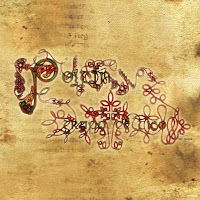 Memorable Data: POITIN–CELTIC GROUP- (1988) – “Original Analog Cassette Covers"
Hi to all… I would like to share with you the covers of the original 1988 “Poitín” release issued on analog cassette tape. 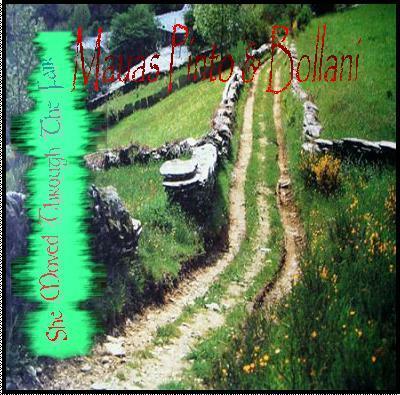 This album is the “first celtic recording” ever done in Argentina, including original and traditional tunes and lyrics accompanied by gaelic harp. 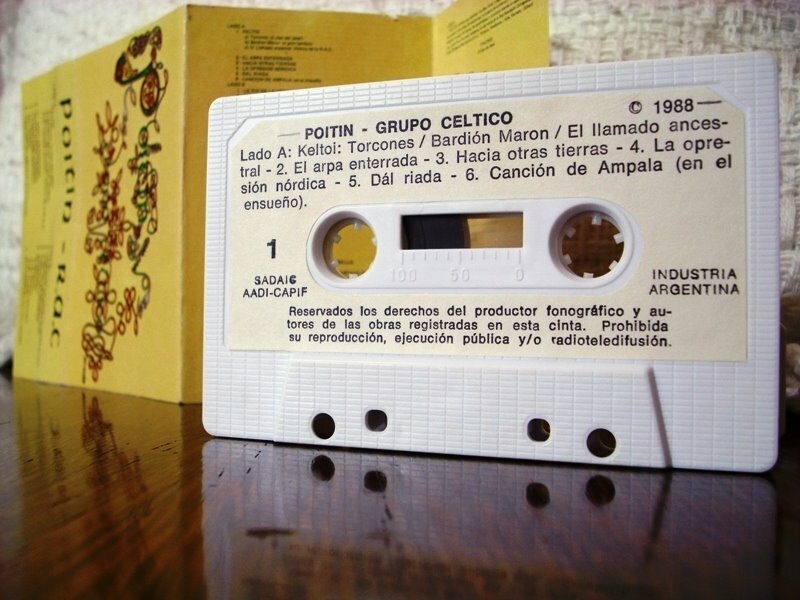 In 1987 I began at the Royal Celtic Association to line-up it’s folk band ‘Poitín’ (gaelic for the reknown irish ilegal whiskey), we did some shows live and for TV, a southern gig among welsh communities in Patagonia, and finally recorded a tape in 1988, which actually is the first recording ever made in Argentina of celtic music, songs and poems, traditional and of our own in galician language. Due to changes of attitudes and feelings towards it’s music the band splited in 1990. During the 17th & 18th Centuries many records of music and poety from Ireland were lost due to countless exiles and threats. Between 1650 and 1660 Oliver Cromwell destroyed over 500 harps in Dublin and almost 2000 all over Ireland. Even in it’s weakest hour, the music and poetry remained under the skill of harpists such as Turlough O’Carolan and preserved later on printed records. The first tune of this set was composed by O’Carolan for the sake of a certain “Eleanor Plunkett” fron his native county of Meath and recopilated by Donald O’Sullivan. The second tune, “The White River Bank” is taken from the repertoire form the Brennan and Duggan families from Gweedore, County Donegal, artistically known as “Clannad”,who presumed has been composed by 1666 in County Tyrone. A mythical song on which water, source of life, reveals as councelor, oracle and warning for the maid in love, who maintains a dialogue with a Xacia or Ondine. We’ve chosen a version in spanish recopilated by the asturian folk band “Trasgu”, the source probably belongs to the region of Navia, at eastern Asturias. Where do you go in search of water, my beloved? Where do you go in search of water? To the river’s mouth I go. With the water’s help, he used to love you. If by the clear water, to the river’s mouth you go. By those days when the United Kingdom was not “united”, many crossed the River Tweed ahead to Scotland to flee from the English opression.As quoted by the welsh folk group “Ar Log” this ancient welsh jig was employed as a dancing tune and also as melody for the song “Go to Berwick, Johny” . Bretons are keen to dolmens, and believe in Korreds, tiny beings watchers jof hidden treasures, inclined to dance, to music and song. In this track we mingle new instruments with old. The tune performed is a “Derobée”, a popular dance from Northern France, either on galic and breton zones. The 1st Part is considered traditional from Gwengamp in Brittany; though as the breeton folc band ‘Tri Yann’ (source of the tune) comments, it has examples in the region of Provence. The 2nd part was composed presently. So…let the dance whirl till the new day…. ELISEO MAUAS PINTO: Gaelic Harp; Bodhrán in track B5-c; F Whistle in track B3; Chanter. MANUEL CASTRO : Bagpipes, Bodhrán, Recitation. RECORDED AT GRAMMY STUDIOS DURING WINTER 1988 –LUGNASAID- IN BUENOS AIRES, ARGENTINA…by the influence of the moon , among rings of smoke and pints of beer. THE ROYAL CELTIC ASSOCIATION is an independent organization. It’s goals are: the investigation, study, and perfection of Galician traditions intending to demonstrate a constant evolution in music and all the cultural context apropiate to present days. Thus, the development of the Highland Galician Bagpipe by Manuel Castro, model based upon the traditional type. based on either traditional tunes or not, according to contemporary folk styles and bardic expressions. 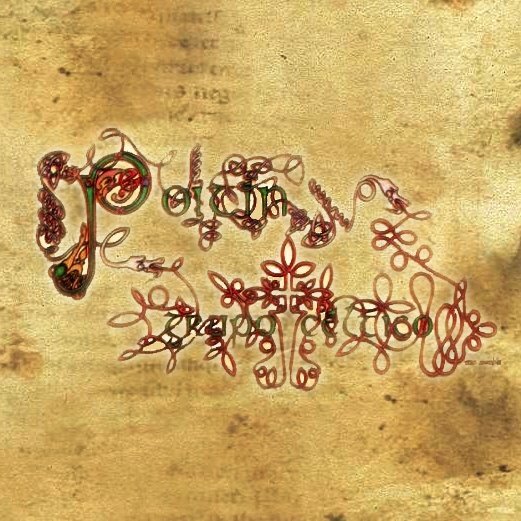 In this way, with an evocative bardic spirit, and replenished by the styles that still echoe in the tradition of our people, we dedicate this work to those who wish to be truly celts, to those who struggle for being celts, to those who actually are celts.